How much interest can a film about one person stuck on a desert island actually create? When Chuck Noland is involved in a plane crash he gets marooned on a desert island; with the risk of never being found again he must battle for survival with natural resources and whatever luck throws his way. Despite Tom Hanks’ Chuck Noland being the only living character for a large part of the film, he’s still developed substantially enough for the viewer to connect with. The addition of Wilson, a ball with a face, creates an interesting dynamic with Nolan continually talking to and worrying about Wilson and underlines Nolan’s growing hunger, desperation and insanity brilliantly. Not only does this create a convincing device for Nolan to play off, but also Wilson himself becomes as real a character as Nolan so when things go badly for the ball the audience relates to it. Chuck Noland is a great example of how a supporting cast is not necessarily needed to build connections or develop character. Using mainly facial expressions and brief imaginary dialogue with Wilson, Hanks displays Nolan as a wonderfully endearing recluse, allowing the viewer to be put in his shoes and go on the journey with him. The sedate, slower scenes allow the situation to sink in for the viewer while showing how lonely and fearful Nolan can get on the island; this is shown perfectly in his attempts to create fire multiple times without success or when he tries fishing with a stick. Despite this, Cast Away is not without its white-knuckle and sweaty palm moments; director Robert Zemeckis uses strobe lighting and loud noises, inside the plane Nolan travels on, to build tension before the crash, and flickering images due to lightning on a long lingering shot of Nolan’s dingy in the stormy sea. These horror elements really ramp up the ante, especially for such important and eventful parts of the film. 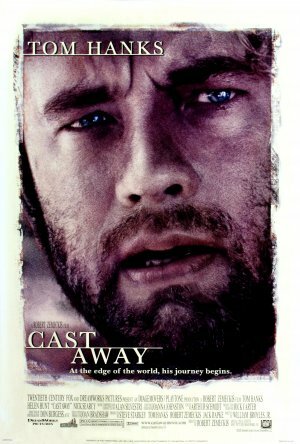 Cast Away does everything it says on the tin, and then some; with a large portion of the film spent on the island and more than enough character development, this is definitely one of Hanks and Zemeckis' finest works.